Digital Subscriptions > Flea Market Décor > OctNov 2018 > GO WEST, Collector! Add some yippee ki-yay into your day-to-day. 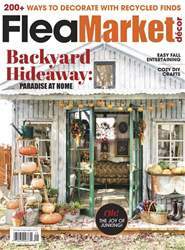 LATER IN THIS ISSUE, YOU’LL ENJOY A HOME TOUR, “HAPPY TRAILS,” devoted to Western Americana style (here’s a little taste at left, and there’s so much more starting on page 96). It might inspire you to start collecting similar items, or maybe pull out what you already own to create vignettes. To get a little more insight into this field of collecting, we spoke with Sandy Torbik, an antiques dealer who sells Western Americana items at Niles Antiques (nilesantiques.org), in Fremont, California.